Have you ever heard of Aurorae Yoga they have some of the best items for yoga training. They have everything from yoga mats, apparel, accessories. 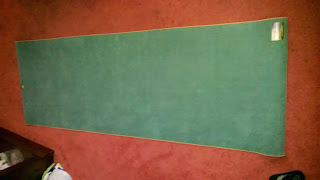 The yoga mats come in all different colors and are very strong and very thick. I was able to review the blank yoga mat in blank. And I absolutely love it I use it during my new workout program called ddp yoga. It feels great it's not hard at all and very comfortable to lay on. Aurorae's new clothing line is proudly made In America from a highly eco-friendly fabric, Lenzing Modal and Spandex. The fabric is made in a carbon-neutral process from beech wood trees, which are 100% self-rejuvenating. The Ultimate Yoga Pant is made with the active yoga participant in mind, but because of its extreme comfort and stylish design can be worn by anyone. Designed specifically for women, The Ultimate Yoga Pant is lightweight, machine washable, breathable, moisture wicking, and features flat lock seams as well as high fabric retention so material will not lose its flexibility or shape. The Fold over waistband features a small pocket ideal for an ID, Credit Card, Money, Key, or Lip Balm. I love both items I got from Aurorae Yoga and will continue to use for a long time.